Free Sticker! This is a limited time offer while supplies last. 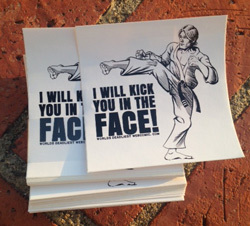 We will send you one of these “I Will Kick You In The Face!” Worlds Deadliest stickers directly to you. Display this FREE decal any place you’d like and show off your knowledge of the Deadliest Martial Arts Web Comic known to man. Simply fill out the form below so we know where to send it to. sending to my nephew who took 3rd in World Taekwondo Championship last year!!! he will get a kick out of this, bahahaha, literally!! Love stickers & kicking people n the face!! Thank you! I will be replacing my neighborhood watch sticker with this one. Thanks, can’t wait to get my sticker! 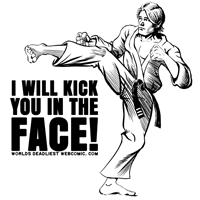 Husband and two kids are both black belts (highest level is 5th degree) in TAKE, they will love this! Woo hoo! (I mean Hi’yah!) Thank u!! Thanks, the sticker is going str-8 on my laptop!! LOVE IT!!!!! This is very cool. Please and thank you.